I love our older pugs, Pugsley and Simba, for their hilarious indifference to missing teeth, distinguished karmic calm, and fully developed personalities. Simba is 10 and somewhat pompous with an enormous charisma. He is the dog incarnation of Winston Churchill. 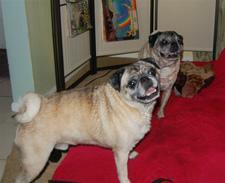 We just adopted 8-year-old Pugsley from CPR, and he is suprisingly nimble and athletic. He can bend his body in a 90 degree angle to mark low-lieing bushes, and he also loves water. He runs to jump in the tub if you say “Ready for a bath?”. And, even more amazing, he leapt into the pool after he saw me jump in the first time, and tried to drag me out by the wrist. They’re two amazing pugs enjoying pug thier silver years, as you can see by Pugsley and Simba’s greying muzzles.